Want a brand new 2017 Toyota Tundra in your driveway? What about a Genuine Toyota Accessories Package? The Bassmaster Toyota Tundra Giveaway 2017 is your chance to win this grand prize valued at over $40,000! Enter now at bassmaster.com/toyotatundragiveaway. 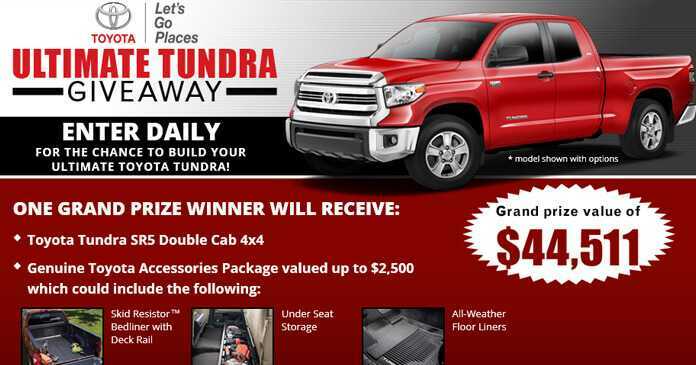 Grand Prize winner will receive a 2017 Toyota Tundra SR5 DoubleCab 4×4 plus a Genuine Toyota Accessories Package, Other Accessories Package, and more. Find out how to enter the Bassmaster Toyota Tundra Giveaway 2017 below and good luck! Visit www.bassmaster.com/toyotatundragiveaway during the Sweepstakes Period. Fill in the entry form by providing your full name, email address, phone number, and complete mailing address. Click “SUBMIT” to receive one entry into the Sweepstakes. $4,000 Cash Allowance that can be used towards installation of Other Accessories Package Items. The ARV of the Grand Prize is $44,511. There are 5 Runner Up Prizes available to be won. Each prizes consists of a $200 Advance Auto Parts Gift Card. Eligibility: The Sweepstakes is open to legal residents of the 50 United States and the District of Columbia (excluding without limitation, those residents if located in overseas military installation, Puerto Rico, and other U.S. Territories or foreign territories) who are age 21 at the time of entry and a U.S. licensed driver. Limit: One Entry per person per calendar day during Sweepstakes Period. Random Drawing: The winners will be selected in a random drawing on or about Monday, September 18, 2017 from among all eligible entries received during the Sweepstakes Period by the Administrator, an independent agent of the Sponsor whose decisions are final. Winners List: For a written confirmation of the winner (available after 9/18/17), send a stamped, self-addressed envelope (no later than 10/18/17), to: The Bassmaster Toyota Tundra Giveaway Winner Confirmation Request, PO Box 25466, Rochester, NY 14625-0466. The Sponsor of this promotion is B.A.S.S., LLC, 3500 Blue Lake Drive, Suite 330, Birmingham, AL 35243. For complete details about this Bassmaster Sweepstakes, please read the official rules.